1.Ajwain seeds promote the efficiency of digestive functions by increasing gastro-intestinal secretions. 2.Ajwain is very effective in treating stomach pain and other stomach related problems. Having 1 tsp of ajwain along with water for one week can help in treating the problems of flatulence, indigestion and gas release. 3.The essential oil extracted from Carom seeds that is Thymol has anti-bacterial and anti-fungal properties. 4.Ajwain is loaded in Thymol which is used as an antiseptic and in the treatment of cough and asthma. 5.For ages Carom or Ajwain Seeds are used as effective home remedies for treating respiratory problems such as common cold, cough, bronchitis and nasal congestion. 6.Eating ajwain twice a day helps in reducing the alcohol cravings. 7.People also use Ajwain oil for leg massage as using it in leg massage helps to cure rheumatoid arthritis. 8.Ajwain for centuries has been used to treat toothaches. You can get rid of toothache by simply gargling with ajwain water. Ajwain fumes are also used to cure tooth pain. 9.Ajwain seeds also work wonders for people suffering from kidney stones. Ajwain seeds when taken along with honey or vinegar for 15-20 days are good in removing of kidney stone. 10.Many people use ajwain seeds as a home remedy to treat acidity and indigestion. To make this amazing home remedy for acidity, take roasted ajwain seeds; and boil it in a glass of water. Drink the strained mixture, it is sure to give relief from acidity and indigestion. 11.Ajwain seeds are loaded with Thymol, hence are used in curing of colic, muscle spasms, cramps and edema. 12.Using a paste made from crushed ajwain seeds with curds is useful in the treatment of pimples, acne, blemishes and blackheads. 13.Ajwain extraction is also used as a home remedy for treating of flatulence. 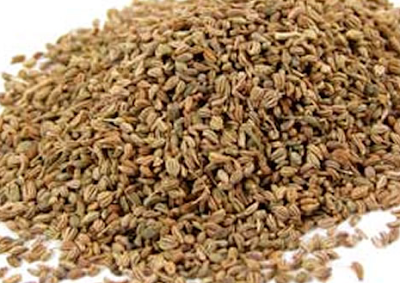 14.Ajwain seeds are very effective in improving your appetite and also help in fastened bowel movement. 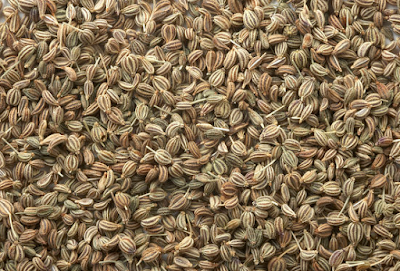 15.Ajwain seeds are also used to treat vomiting, mouth diseases and piles.